I wrote last week about Andra Ursuta who was included in the Saatchi Gallery Body Language Exhibition. Body language seemed an appropriate classification also for Virgile Ittah, though checking with the website, it turns out that it is part of the separate exhibition New Order II: British Art Today. Ittah was actually born in France but works in London and undertook an MA at the Chelsea College of Art. It appears she may feel no particular sense of belonging anywhere. Her website speaks of her work being informed by her family’s exile and constant wandering. Her sculptures both impress and disturb though in my case that was partly tempered by simple curiosity – how had she made them? They are a strange blend of the classical and the horrific. Constructed from mixed wax, marble powder and fabric it is not entirely clear to what extent they are cast, modelled, carved, or indeed melted, or possibly a combination of all four. Certainly the photograph of Ittah on her website shows her with what looks like a carving tool and fragments of wax round her feet while in the background there is a container of melted wax. The difference of textures in the sculptures suggest that a variety of techniques have been used. Presumably because of the marble powder they contain, the sculptures display some of the characteristics that they would have had if they had indeed been carved from stone but yet because of the nature of the wax, there is a warmer element to them that is more like human flesh. 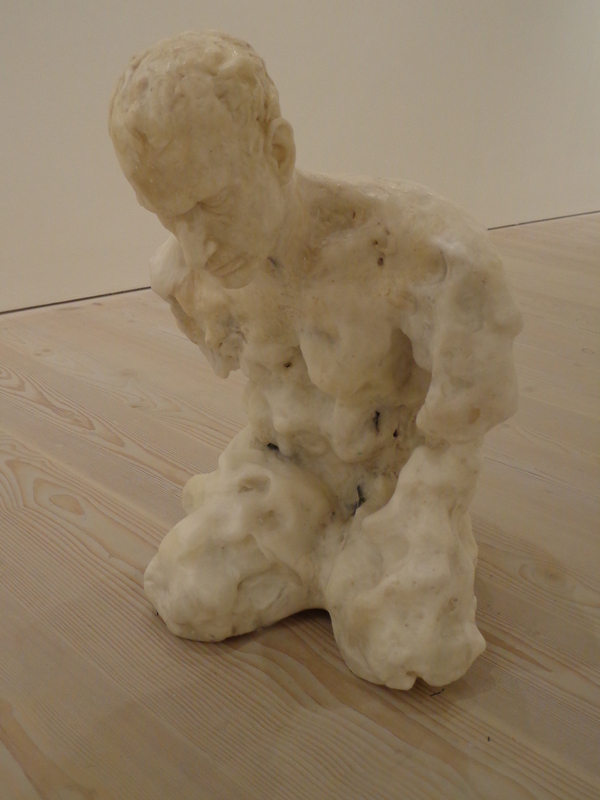 Each of the figures on display have a relatively unscathed head which has been formed with sensitivity but as the eye scans the naked bodies you see that each to a greater or lesser extent appears to have succumbed to varying degrees of decomposition suggesting the inevitability of death and decay. In the work above Untitled (for man would remember each murmur) the arms and legs have all but disappeared leaving just the torso which itself is appearing to melt. You feel it is just a matter of time before the fine face shares the same fate. He reminded me of those ancient statues from Greece or Rome who have lost limbs as a result of vandalism, earthquakes or war, and been eroded by time and by rain. I would, however, quibble with his title: Ittah is not alone in this manner of naming, but to my mind a work is either untitled or it is not; you can’t really have both. In Regarding the Pain of Others, a title paying homage to Susan Sontag’s book of the same name, the woman’s face, eyes unseeing, mouth open suggests a death mask, though no corpse could remain propped up in such a way on a chair. The breasts suggest the living but the legs are already in advanced decay. I particularly liked the detailing of this piece. Look at the back shot. The chair has caused the skin to wrinkle, while the weight of the body is also shown in the compression of the buttocks. The chair here is important; by using a real chair brings the sculpture indisputably into the present. In Dreams are guilty, absolute and silent by fire, the woman appears to be sitting on her stool, again a real stool, in a meditative position. Facing her is another similar but empty stool, suggesting someone missing – a sense of loss. Again her legs have suffered the ravages of the grave; the flesh is falling off the bone. One hand is already gone, her right breast is succumbing to disease or corruption. Intrigued by the works, I tried to find more detail about Ittah’s own history but there seems little internet information on her or the nature of the family’s exile. When making them Ittah may have been thinking about her own family’s tribulations, but for me the works are powerful as they not only emphasise human mortality but they also remind us that nothing lasts for long– not even statues carved in stone.